The Steel Warrior Arm Bracers have a simple, yet very appealing design. They feature a smooth steel finish with small studs along the top and bottom edges. 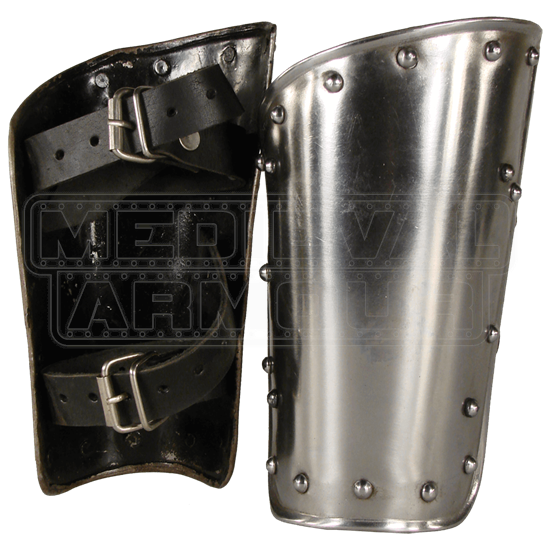 The Steel Warrior Arm Bracers are crafted from 18 gauge steel and are sold as a pair. These bracers attach to the forearm by two leather straps and buckles. These bracers are great for Medieval Fairs, LARP events, and most other re-enactments. just what I needed to complete my armor set. These bracers are extremely well built, as all Epic Armoury armor is. They look fantastic. Hard to see from the photo, but the straps are one-piece that go all the way under the steel, then riveted in place on the sides. This gives an 'air-space' between the steel and arm. They are supremely comfortable with the Leopold padded bracers underneath, and look awesome!